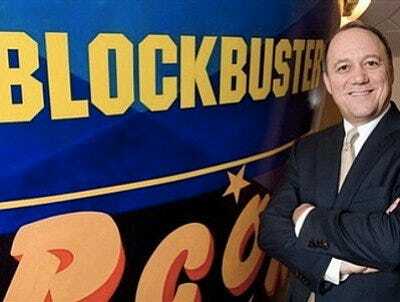 Blockbuster, the shrinking movie rental business, is hoping that a Hail Mary transition to kiosks and digital movie distribution will save it from going to zero. The most alarming exchange: About 1 minute, 15 seconds in, when Keyes tries to suggest that Blockbuster’s retail legacy will be helpful in its switch to digital. Sorry, but Blockbuster’s brand carries zero equity on the Internet. That’s like making the argument that Sam Goody or Tower Records could steamroll Apple’s iTunes just because it once had a large offline presence. Assuming digital ever gets big — so far it’s very tiny, with DVD still five times bigger — the winners are going to be the companies with the best distribution, content, technology, and pricing. There’s just no way that Blockbuster is going to win in any of those categories, let alone all of them. Maybe, just maybe, there’s an argument to be made that Blockbuster’s legacy DVD relationships could score it some more attractive digital rental windows that Hollywood won’t give iTunes, Netflix, or Redbox. But if Hollywood is going to play nice with anyone, it might as well be the cable industry, which actually has a future, or Walmart, which sells vastly more DVDs than Blockbuster, is not shrinking, and just bought a digital movie business, Vudu. Meanwhile, Blockbuster’s cable rivals like Comcast already have far stronger distribution — via the set-top box already in your living room, and the dedicated video pipe running into your house; Apple and Netflix are arguably leading the technology race; and everyone’s on-demand pricing and content is pretty similar right now. How about Blockbuster’s opportunity to sell some of its stores for quick cash to pay down its debt? (As CNBC’s Dennis Kneale asks at the end of this segment.) That’s also not in the cards. Jim Keyes says Blockbuster leases almost all of its stores on “very short-term leases” — so the company doesn’t have much of a real estate portfolio. Instead, Keyes describes this as a “stepping stone” to help shift its customers to digital solutions. Come again?